Move over SUVs, there’s an ongoing demand for a new kid on the block – off-road pickups! The automotive market has been going through a great deal of change in recent years as the popularity of SUVs and Crossovers have steadily crept up on the sedan market, even causing some major manufacturers to significantly reduce their own sedan lineups. Of course, as the market changes so do the perceptions of consumers, who are now looking at pickups as something other than a work tool or rural life staple. Market trends indicate that buyers are looking to pickups to haul their family or to get a taste of the great outdoors instead. Sales of smaller, nimbler midsize trucks have grown consistently every year over the last four years, according to Edmunds. Additionally, Edmunds is also reporting that a considerable share of those midsize truck sales has gone to pickups outfitted with skid plates, knobby tires, lift kits, and 4×4 systems designed to tackle rough terrain. The verdict seems to be in and midsize pickups are gaining an identity completely separate from their full-size counterparts – these new kids on the block are meant for having fun! Kelley Blue Book analyst Rebecca Lindland stated that the popularity of these trucks indicates that buyers are looking for flexible but unique, expressive vehicles. “We are also seeing this in SUVs and crossovers, where people are willing to drive a vehicle that has a little bit more utility and expressiveness, but it doesn’t necessarily need to be huge,” Lindland said. Expressiveness is of the essence? 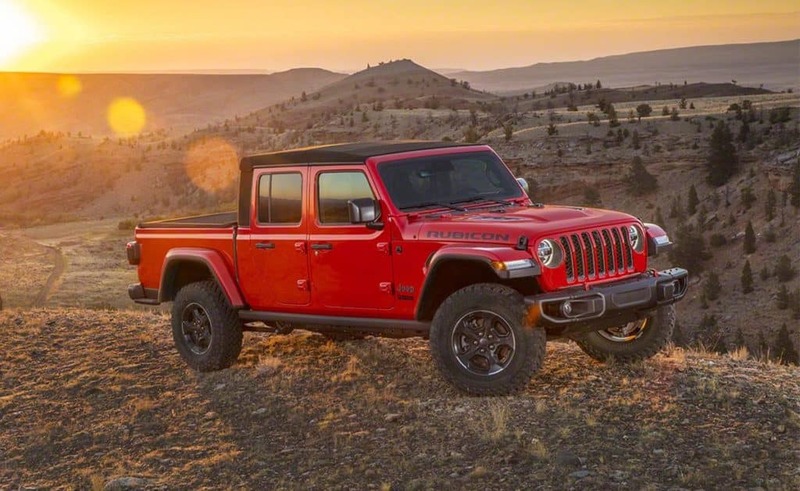 Enter the 2020 Jeep Gladiator. The off-road pickup market might’ve been doing alright before its existence, but by the time the Gladiator hits dealer lots next spring it’ll be booming. The rugged Jeep Gladiator marks a new frontier to conquer for the automaker practically synonymous with off-roading and adventure. An already profitable and fast-growing segment is expected to work in the brand’s favor according to industry experts, but the latest addition to the Jeep lineup can take the segment by storm all by itself. Touted as the “most capable midsize truck ever”, the Gladiator offers a traditional body-on-frame chassis, a steel truck bed measuring five feet in length, different roof options, four trims (Sport, Sport S, Overland, and Rubicon), and two different 4×4 systems – Command-Trac and Rock-Trac – for unprecedented off-roading capabilities in a pickup. The Gladiator will have to vie for attention among several competitors, but its ability to crawl over rocks, drive through rivers, and race through the desert will be enough to make it stand out. Looking to join the adventurous off-road truck trend? Follow Hollywood Chrysler Jeep on social media to keep up to date with the latest Jeep Gladiator news and know when it becomes available. Additional news about specs and accessories are sure to trickle out before the pickup makes its grand debut in our dealership and we’ll be here to help ramp up the excitement.